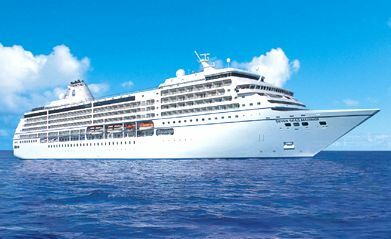 Seven Seas Mariner offers a unique all suite experience for its 700 pampered guests. Regent’s all inclusive experience ensures that you won’t be worrying about small transactions on this ship. From the moment you step into the atrium, the grand spiral staircase crowned by a beautiful blown glass art installation will astonish you and create a stunning atmosphere as you descend the glass elevators. The steakhouse, Prime 7, has cream colored pillow backed chairs contrasted by sapphire walls and wood finishes. Compass Rose offers guests an unprecedented level of choice as well as a beautiful look with crystal chandeliers, wooden accents and celestial furnishings. Chartreuse offers up a menu that highlights modern French cuisine. Head over to the pool deck to enjoy the open layout with a mosaic tiled pool surrounded by white daybeds. The library offers quiet relaxation among its dark wood bookshelves, cream furnishings and copper chandelier. The Canyon Ranch Spa is the height of luxurious relaxation and the adjoining fitness and aerobics center offers state of the art machines. The card room, boutiques, Constellation Theater and casino will also keep you entertained throughout the ship. When you’re ready to retire, head to your room to enjoy a rest on Regent’s exclusive Elite Slumber Beds.